Our chapter is named for Tabitha Moffatt Brown. But she is more than a namesake, as her life story resonates with our members today. Tabitha exemplifies many of the attributes we value as women, including strength, perseverance in the face of great hardship, and service to the most needy of her community. We love it that Tabitha never let her age slow her down from doing what she wanted to do. 1780—Tabitha’s Birth in Massachusetts. Her birth was during the American Revolutionary War, and her father served as doctor to Col. Gideon Burt’s Regiment. 1799—Married the Reverend Clark Brown in 1799. They had four children, of which one died in childhood. 1817–The Reverend Brown died, leaving Tabitha to earn a living for the family by teaching school. This she did until moving to Missouri with family. 1846—Spring. The Oregon Trail. Tabitha joined her family, bound for Oregon. At that time, Tabitha was 66 years old. She witnessed the extreme hardships of the trail. 1846— August. 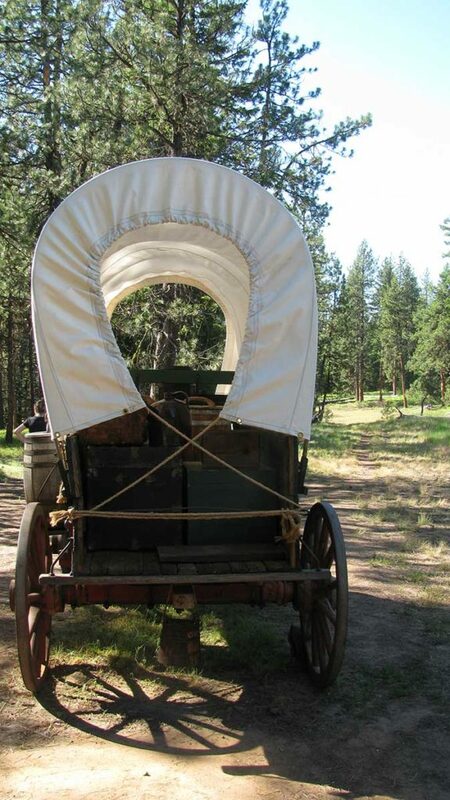 At Fort Hall, Idaho, the family was divided on which route to reach Oregon. Tabitha joined her daughter’s family on a new southern route. 1846—Summer/Fall. The route proved dangerous and long, and the hired guide abandoned their party. They nearly starved as winter fell, with Tabitha and a brother-in-law at one point riding ahead for help. Ultimately, Tabitha’s son arrived with supplies to take them to the Willamette Valley. 1846—Christmas Day. Tabitha arrived in Salem. 1847—Tabitha thought she was penniless but found a small coin, called a picayune. It was worth about 6 cents and paid for some needles. She traded some spare clothes for buckskin from the local Kalapuya Native Americans. Tabitha sewed the buckskin into gloves, earning $30, or the equivalent of $924 in today’s money. 1848—Tabitha met the Reverend Harvey Clark and discussed the needs of the children whose parents had died on the Trail. They began a school for those orphans to both live and study. Other families tuitioned their children into the school, which soon had 30 students. It was located in modern day Forest Grove. 1849—The Territorial Legislature granted the school an official charter as “Tualatin Academy.” This was the first official act of the new provisional government. 1850—A new large building, later known as Old College Hall, was built to house the academy. 1854—The Territorial Legislature altered the academy’s charter to allow the creation of Pacific University, which is a thriving university today. It is particularly known for its optometry and business schools. Today, students still use Old College Hall for special events and traditions. 1854—Tabitha moved to her daughter’s in Salem. She kept up a correspondence with the staff at the school, family in the Midwest and more. 1858—Tabitha Moffatt Brown passed away. She is buried in Salem Pioneer Cemetery. 1987—The Oregon Legislature honored Tabitha with the title “The Mother of Oregon,” stating that she “represents the distinctive pioneer heritage, and charitable and compassionate nature, of Oregon’s people.” To this day, a photo of Tabitha Moffatt Brown hangs in the governor’s office, visible to the public and of course, school children, on all official tours. 2017—Pacific University representatives and descendants of Tabitha joined our chapter in honoring her with the DAR Women in American History award. This event took place at Old College Hall, where students still gather throughout the year for special events and traditions. Tabitha Moffatt Brown Chapter NSDAR thanks and gratefully acknowledges the following sources for the facts used in the writing of this timeline. American history enthusiasts are encouraged to seek them out and read further. 1. Tabitha Moffatt Brown’s own letters. Available at the Multnomah County Library or the Pacific University Library. Two key letters can also be read in the book Covered Wagon Women: Diaries and Letters from the Trails, 1840-1849, edited by Kenneth L. Holmes. 2. The online “History of Pacific University” found here at the official university website. Current information cited about the university can also be found on its website. 3. The online biography “Our County Through Time: Tabitha Brown” by Kirsten Thomas, WCM Archival Volunteer found here at the Washington County Museum website. 4. 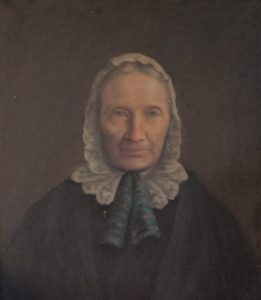 The online history “Tabitha Brown, the ‘Mother of Oregon,’ ” by historian Mary Jo Morelli, found here on the Friends of Historic Grove Historic Site, provides details of Tabitha’s early life, marriage and widowhood. 5. The online history “Our County Through Time: Tualatin Academy and Pacific University,” by Liza J. Schade, Washington County Museum Curator, found here gives information about her gravesite. 6. The details of Tabitha’s father’s service in the American Revolution, can be found by searching for Joseph Moffatt in the NSDAR’s Genealogical Research System, a public version found here.